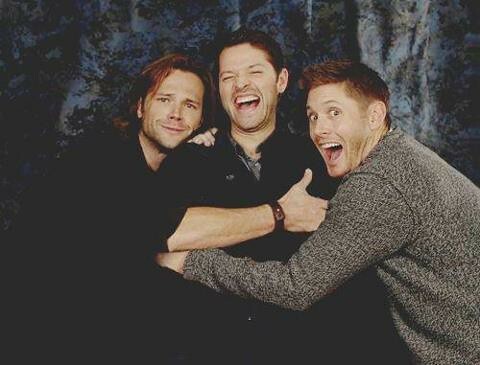 It might be shocking that I haven’t really watched Supernatural (SPN) before, considering it’s pretty much sitting in my sweet spot of horror, comedy, and bromance. I almost started watching it on Netflix many times, but it started feeling a bit overwhelming...10 seasons of source material (now 11, soon to be 12) is a commitment. Luckily, last Halloween The Goog and I decided on our most labor intensive costumes to date (The Hound and Arya Stark), and for me this meant a lot of time sitting on the floor cutting, stitching, shaping and gluing. What better time for a viewing marathon? 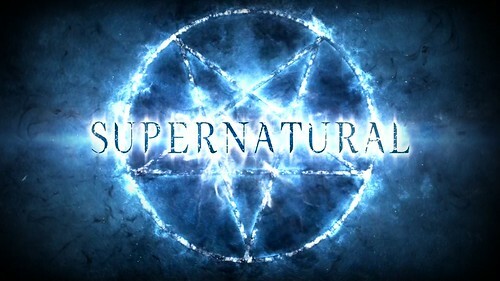 So, it took months but I have now seen every episode of Supernatural there is to see, including being up to date on season 11...and yes, it was recently announced there will be a season 12. Yeah, 12 seasons. And the word out there seems to be that as long as ratings hold, and the cast wants to keep doing it, the network seems happy to let it ride. This show is the best kind of popcorn, it's fun to watch, and has a talented cast. So as I felt myself being pulled into the cyclone of SPN love, I wondered about the secret ingredient. Why does this show continue to inspire such a fanatical following? So I put on my snorkel and mermaid fins and dove into the Supernatural fandom to figure out what makes it so intense. This cast loves each other, like for reals in real life. - Spend a little time reading about cast and the thing that comes out fast and strong is that Jared Padalecki (younger brother Sam Winchester) and Jensen Ackles (older brother Dean Winchester) don't just play co-dependent brothers on the show, they are real life besties. Their families spend holidays and take trips together (which they share on social media)! Throw in other cast members, like Misha Collins (the angel Castiel), and Mark Sheppard (the demon Crowley), and you can find tons of memes, videos, and accounts of how the cast supports, cares for, and pranks each other. 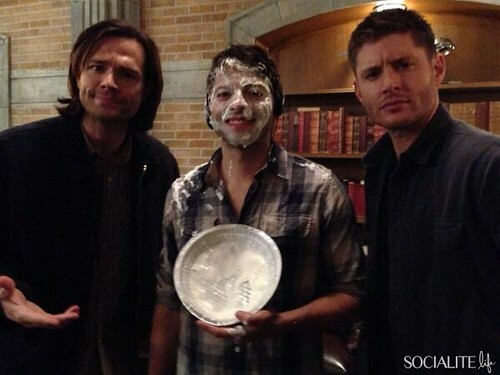 My personal favorite prank story involves Misha Collins (in this case acting as episode Director) getting hit in the face with a whipped cream pie by Jared as he walks on to the set. Fast forward to Misha leaving his trailer after getting cleaned up, only to be hit with another pie by Jensen as he walks across the lot. Clearly there has to be a lot of trust to pull something like that. This extreme level of camaraderie comes though in the show. This cast loves its fans. - Supernatural has its own series of conventions. Like all-SPN-all-the-time conventions. And during these conventions the cast engages with fans in a way that few casts do. There are photo ops where they seem to be willing to do any pose requested from wearing crowns and tutus, to fighting over babies, and giving in character hugs, and karaoke costume parties with the cast. It's clear the cast wants to be there and understand that the fans are the reason they've been employed for 12 seasons. This type of gracious behavior always endears a celebrity to me. PS- I tried to get someone to go with me to the most recent Vegas convention at the last minute, you know for research, but it was a no go. -OK, speaking of fans...I can fangirl with the best of them, but this fandom, wow. It's big, and strong, (it puts the super in "superwholock") and has apparently taken over Tumblr. I don't have a tumblr (I do not need another internet thing to get lost in), but I do have a Pinterest account and that's been plenty educating. From starting with the more generic search of "supernatural" and moving to the search term "Meanwhile Misha" (PS: Do this. Misha is a national treasure), there is a mind boggling amount of memes, fan art, and gifs. In fact, this fandom prides itself on "having a gif for everything," which basically means the fandom responds to every post on tumblr with an SPN based gif. 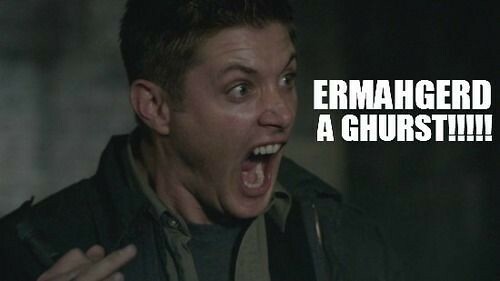 Now that I understand more of the SPN "in" jokes, I kinda feel like I get more of the internet now. Lots of charitable initiatives have sprung up from the cast and the fandom -So basically what I'm telling you here is this cast is a bunch of good people who, in addition to their day jobs acting, do a bunch of good works. It would almost be sickening if it wasn't so great. 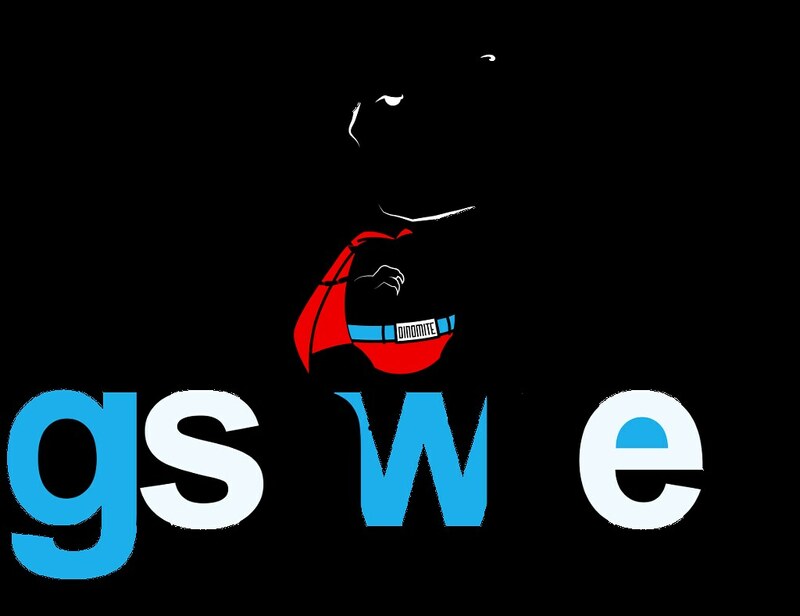 GISHWHES- Also known as The Greatest International Scavenger Hunt the World Has Ever Seen. Created by Misha Collins and in partnership with Random Acts , the goal here is to get people out to do good in the world. It's less a scavenger hunt and more a week long frenzy of public art, displays, and kind acts. Side note: Some of the Ladies participated GISHWHES this last year and it was a blast (not to mention a great distraction for yours truly who was going through some day job struggles). We met new people, I wore a dress made of construction paper, and helped out some local good causes. Always Keep Fighting- Show star Jared Padalecki has been open about his own struggle with anxiety and depression. In March of 2015, Jared started The Always Keep Fighting campaign and donated funds from special t-shirt sales to organizations who help support mental heath issues. Since then #alwayskeepfighting #AKF has become a rallying cry for fans who suffer similar mental health issues and is a reminder that they aren't alone in their struggles (more in that in a bit). Wayward Daughters Academy- As you have probably notice, Supernatural is pretty dude heavy. The largely female fandom has noticed too. 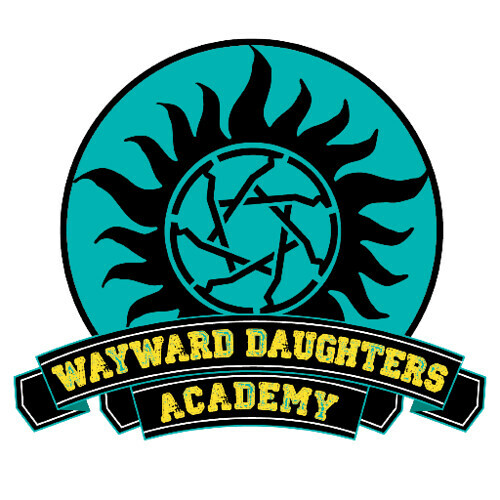 Enter Wayward Daughters Academy. Kim Rhodes and Briana Buckmaster both play pretty great lady sheriffs on SPN, and together they launched a fundraising campaign to both support Random Acts, but to also bring more women with substantive roles into the SPN universe. You Are Not Alone- This is the newest and probably the most fascinating undertaking. After hearing from so many fans about mental health issues Misha Collins and Jensen Ackles have partnered together to launch the SPN Family Crisis Support Network. This is a fan-based support system where volunteer fans are trained to help other fans deal with issues around depression, self-injury, and addiction. Needless to say I have never heard of anything like this and love the idea of harnessing the power of fandom for something so positive. OK, so what I'm telling you here is merely a toe-dip into SPN and the fandom. But I like enough of what I've seen to keep splashing around, and am looking forward to having another season to watch. So in the words of Netflix, “Are you still watching Supernatural?” Yeah! Yeah I am! ANNOUNCEMENT! 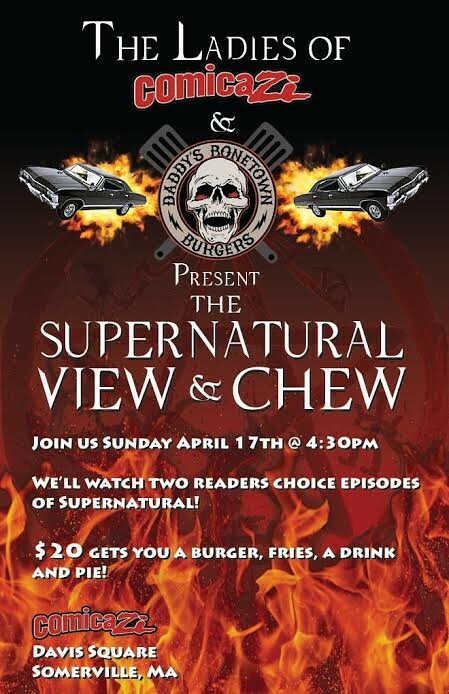 Local People (and people who want to travel)- Due to the success of the Bob's Burgers View and Chew, the Ladies, partnering with Daddy's Bonetown Burgers will be hosting another View and Chew on Sunday April 17, at 4:30 at Comicazi in Davis Square. $20 will get you a burger, fries, drink, and pie to chew while you view. Bring a little extra money to participate in the raffle for SPN crafts lovingly made by Tiny Doom. We are letting you decide what 2 Supernatural episodes we show, so check out the poll below and let us know what you would like to watch!